Chargers football has been an offensive juggernaut this season, and they show no signs of slowing down. The team is averaging 35 points per game, despite doing it all without standout senior wide receiver Devin Martin. Martin broke his foot in week one against Bryant University, and is expected to miss the rest of the 2018 season. Last season Martin recorded 46 receptions for 836 total yards and five touchdowns. He was a reliable set of hands for senior quarterback Ajee Patterson. “With us losing Devin Martin for the season we lose a trusted leader, someone we could count on every single game and a playmaker that cannot be replaced,” said head coach Chris Pincince. “He had at least one catch in 33 career games and we miss that, hopefully we will get him back for an additional season next year”. In Martin’s absence, Patterson now has three receivers that helped the Chargers put on this offensive showcase. Patterson’s most targeted receiver so far has been graduate student Ju’an Williams. Williams, through three games, has accumulated 23 receptions for 401 yards and three touchdowns. His receptions, yards, and touchdowns are all tied for the lead in the NE-10 conference. Williams also leads the NE-10 with 133.7 yards per game and is tied for second with 7.7 receptions per game averaging 17.4 yards per reception, ranking him second in the NE-10. After Williams, is junior Damon Rodgers who started the season with 11 receptions for 169 yards, and two touchdowns. His receptions and yards have earned him the eleventh and seventh spot in the NE-10, respectively. He is also top -10 in yards-per-game averaging 56.3, and 15.4 yards per catch which puts him in fourth in the NE-10. The last of Patterson’s three headed monster is junior wide receiver AJ Greene. Greene made his presence felt against cross-town rival Southern Connecticut State on Saturday Sept. 15 as he hauled in a team high five receptions against the Owls. In three games this season Greene has nine receptions for 107 yards and one touchdown. Greene ranks 16th in the NE-10 in total yards and is 10th in yards per catch with 11.9. “The trio of Ju’an Williams, Damon Rodgers, and AJ Greene have all done a great job of playing hard every snap, understanding their roles on the team, and helping the offense any way possible” said Pincince. “They all understand that on any given day, or any given play, any wide receiver could catch the football in our offense and all of them have been getting better from week to week understanding that very message. I expect all three to continue to work hard and make plays each and every week”. Patterson has been given a lot of hands to throw to and he is taking advantage of it. 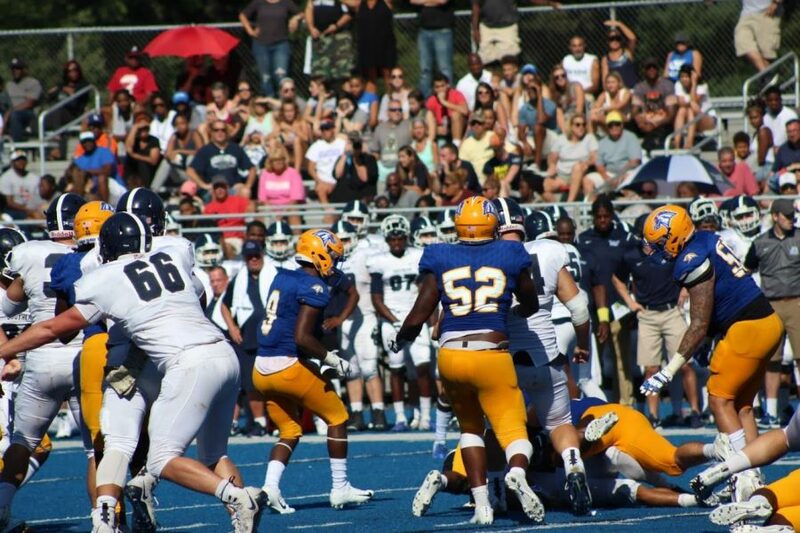 Patterson has thrown for a total of 822 yards and eight touchdowns and currently leads the NE-10 in both categories. Martin’s production will be missed on the field, but the Chargers have made the best of the hand that they were dealt.